From the comfy armchairs of your home, Central Asia seems like a wild beast of a place. But the reality is that it’s safe, full of friendly people, home to interesting cultures, plus offers so many beautiful and varied landscapes. 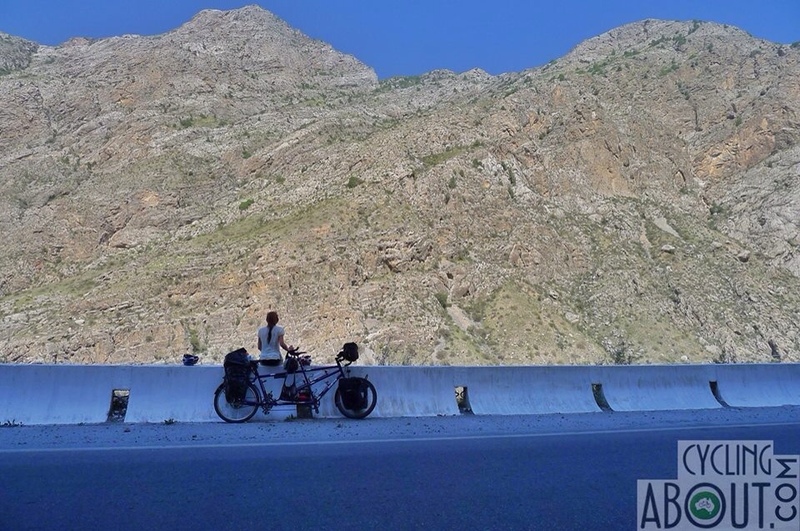 I had an amazing time riding from Georgia, across to Iran and north to Kyrgyzstan as part of my Central Asian leg of a cross-continental tour. For the purposes of this FAQ page I’ve included Georgia, Azerbaijan and Iran because people travelling Central Asia normally head to these countries as well. They’re a modern day section of the Silk Road if you will. 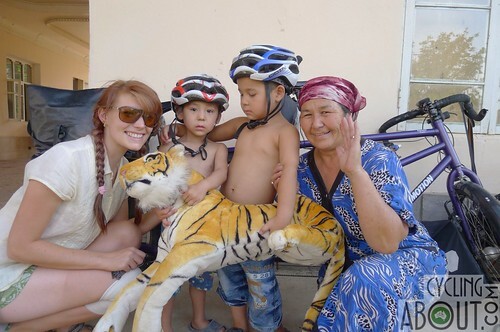 Let’s debunk any travel myths and perceptions about Central Asia! Kat looking out over the mountains of Kyrgyzstan. In my six months from Georgia to Kyrgyzstan, I didn’t experience any theft, accidents, arguments or even feel threatened at any time. That said, women travelling alone or with their partner should definitely look out for less-than-faithful men (more below). Which Country Has The Most Dangerous Drivers? Iran has ‘stupid’ drivers (although not stupid people); head checks are rare and the ‘might is right’ rule is widely applied. The number of times I saw ‘nearly accidents’ was insane! Iranians also drive fast (sometimes on the wrong side of the road) and weirdly seem their happiest reversing. A good rule to follow is that you should only worry about what is in front of you. Georgia has dangerous and often drunk drivers who are generally courteous towards cyclists. They will overtake you (with space) at the most inappropriate times, but rather than that being a problem for you – it is often a problem for the oncoming drivers. Kyrgyzstan has flat-out dangerous drivers. They pass at proximity and at high speeds. This is because they can; the road surface is commonly smooth and predictable unlike a lot of the region. The worst road rage I experienced (since leaving Australia, actually) was in the north-east region of Kyrgyzstan near Issy-Kul Lake. Do You Have To Bribe The Police? I never paid a bribe. Policemen sometimes ask for money at checkpoints, but I generally play ‘dumb tourist’ for these situations. You should beware of some of the police tricks, such as taking your passport “for inspection” and asking for money in exchange its return (use a colour photocopy). The Osh Bazaar in Bishkek is notorious for this! Tajikistan/Dushanbe: April/May (24-27 degrees celsius) or September/October (30-25 degrees celsius) Note: The Pamir Highway is best tackled in June/July/August. Kyrgyzstan/Bishkek: April/May (21-26 degrees celsius) or September/October (26-20 degrees celsius) Note: The Kyrgyz mountains are best tackled in June/July/August. ***Temperatures given are the average maximum for each month from large cities. If you are cycling the whole region, your route timing should be centred around the extreme climate areas such as Kyrgyzstan/Tajikistan (the cold comes early in the mountains) and Iran/Turkmenistan/Uzbekistan/Kazakhstan (unbelievably hot in June or July)! If you are cycling at 1500m elevation and above, mid-June through to mid-August is the best time to be around. The hot weather in Iran had us sleeping under the road in drains from 11am-6pm. Which Country Is The Best To Tour By Bicycle? My favourite country for the cycling was Kyrgyzstan: the mountainous terrain is splendid, the roads are often good quality and the people are wonderful. I didn’t get to Tajikistan/Pamir Highway however, a favourite for many other riders for its less-travelled roads. What Is The Road Quality Like? I found sealed roads to be generally quite good in Iran and Kyrgyzstan, with an all time low in Turkmenistan! Across the board, roads are passable at best. Bring tyres wider than 40mm. 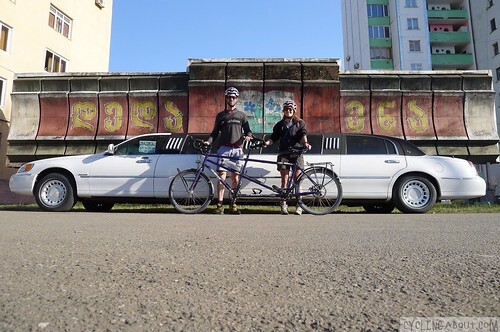 You’re lucky if the road is good enough for a limousine. How Much Are Basic Hotels Across Central Asia? The most expensive countries for hotels were Azerbaijan, Turkmenistan and Uzbekistan, where US $40 for a double room was common. Hostels were sometimes even more expensive! Georgia and Kyrgyzstan were around US $20 for a double room. In Iran hotels were the region’s cheapest. I stayed in clean double rooms for US $5-15 regularly. In Kyrgyzstan, guest houses and yurt camps are common in areas frequented by tourists. They are often around US $7-10 per person including breakfast. Many of these locations allow you to set up your tent at a reduced rate. 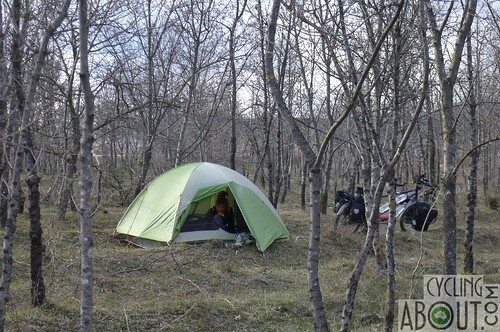 Can You Easily Wild Camp In Central Asia? Most of the time it’s not a problem. Even if people do find you, they’re more often excited than bothered. That said, drunk people stumbling into camp have been a known problem in Central Asia. Wild camping in Eastern Georgia. 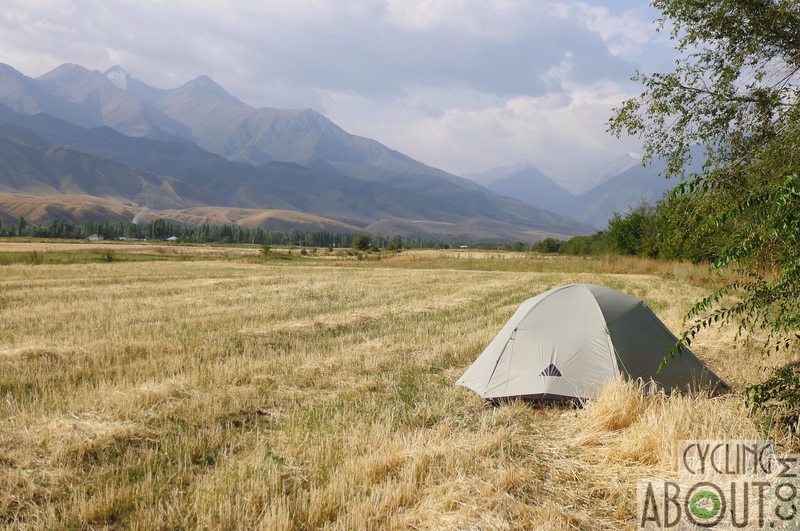 Wild camping in a field in Kyrgyzstan. Is It Easy To Hitch Hike in Central Asia? We got lifts with our loaded touring tandem when we needed, and the truck drivers we got to know were incredibly kind and generous. We were never asked to pay and never waited more than a few minutes! I’ve heard that if a driver was going to ask for payment, it would be in Kyrgyzstan as it’s common for people to sell seats in their car/truck for a lower rate than a local bus. Friendly, kind, inquisitive, beautiful, inviting, hospitable, generous. Never a dull moment staying with locals in Central Asia. Which Countries Did You Find Most Friendly? In terms of hospitality – Iran, Turkmenistan, and the less-touristic areas of Uzbekistan and Kyrgyzstan are a step above the rest. Every day, people will ask you where you are from and whether you like their country. 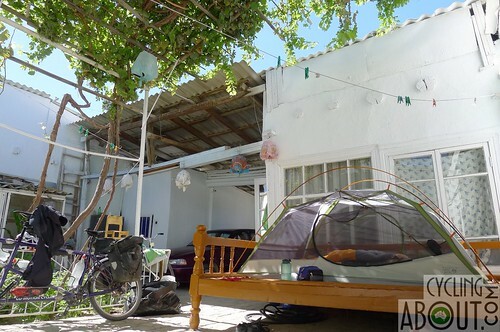 You will often be invited to join people for local dining, drinking tea or even to stay the night at their family home. Sometimes people will present you with food, water and even gifts while you cycle along. Dining with a large family in Iran. In any of these countries it’s acceptable to ask to camp in yards/fields or collect water. We weren’t knocked back more than one time in one hundred! The people in Iran are different from the rest: they are much more forward and will inquisitively come up to you in the street to ask for your phone number or email usually in exchange for theirs. They have a lot of questions for you and will reward you for your time. Some cyclists find being constantly stopped throughout the day annoying – I found it fortifying and incredible that so many people take time to meet you. Showing a group of new friends some of our CyclingAbout videos. If I Get Invited to Stay with Someone, Should I Bring a Gift? Yes! In most places, a gift on arrival is an important ritual in hosting. I’ve given away all kinds of things, but the most universal gift I’ve found is a nice box of chocolates. Who doesn’t like chocolate?! Which Country Is The Worst for Female Travellers? Kat found the men in Georgia to be the worst. Constant ogling, staring, sexual gestures and inappropriate touching. Men even tried to pull moves on Kat – despite knowing we are married, and even while I was there! Interestingly, there was a noticeable difference in the way men treated Kat on both the Turkish or Azeri sides of the Georgian border. Other women I’ve spoken to have had truly positive experiences in Georgia – usually while travelling in larger groups, so it is possible that we just had a bad run. You can read our trip diary from Georgia HERE to gain more of an insight. I never really had problems with men in any other country in Central Asia. Women may also feel a bit out of place in Iran; being covered up and in occasional circumstances where, due to cultural reasons, men do not acknowledge/address you and instead talk to any male you might be travelling with. Are There Any Areas Where Locals Try To Make You Pay Them For Things That Should Be Free? I was only been asked to pay for camping or water in areas frequented by tourists near Issy-Kul lake in Kyrgyzstan. It’s probably because there is a homestay culture there, and locals feel like they deserve a slice of the pie. Setting up our tent in a neighbourhood backyard in Uzbekistan. What Food Should You Look Out For? – The bread in EVERY country in Central Asia! Especially ‘barbari’ bread in Iran and Tandir-cooked bread in Azerbaijan, Uzbekistan and Kyrgyzstan. – Georgian manti (dumplings) are incredibly delicious (especially with mushroom), rolled eggplant pieces with walnut paste and pomegranate seeds and Katchapuri Azeruli (an open boat of bread with butter, cheese, egg and salt). – Homemade biscuits in Georgia. – Lavangi chicken (a walnut paste filling) in southern Azerbaijan. – Ku-ku and Eggplant/walnut paste/pomegranate in Iran. – Tah-dig (crispy rice) and tah-chin (eggy rice) in Iran. – Falafel in the southern cities of Iran (Esfahan and Shiraz). – Iranian ice cream is sticky and delicious, you must try saffron and milk/banana. – Potato somsa in Turkmenistan and Uzbekistan. – Lagman noodles and Plov in Uzbekistan. – Dymdilma (vegetables and meat cooked slowly in a big wok) in any home in Kyrgyzstan. – Tandir cooked bread-somsa (onion/meat) in specialty restaurants in Kyrgyzstan. 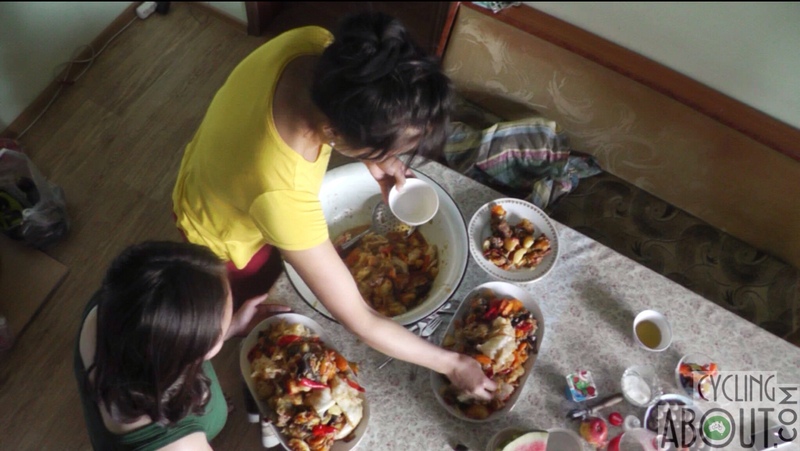 Cooking Dymdilma with a wonderful family in Kyrgyzstan. Do People Throw Rocks At You? I didn’t have any incident with children or adults throwing rocks at us in Central Asia. Are The Visas Hard To Obtain? You can get everywhere if you plan ahead. Some countries require a letter of invitation (LOI) for your nationality (Iran, Uzbekistan and Tajikistan for Australians). Tour companies in Central Asia will charge you US $40-$50 to give you a government-approved number. The best company I dealt with for LOIs was Stan Tours. Our Iran LOIs took a really long time (two months) through Let’sGoIran, so I’d advise against them. There are also countries such as China and Kazakhstan which seem to change their rules overnight regarding tourist visas and requirements, which can be a nightmare. Check out Caravanistan for the most recent visa information. 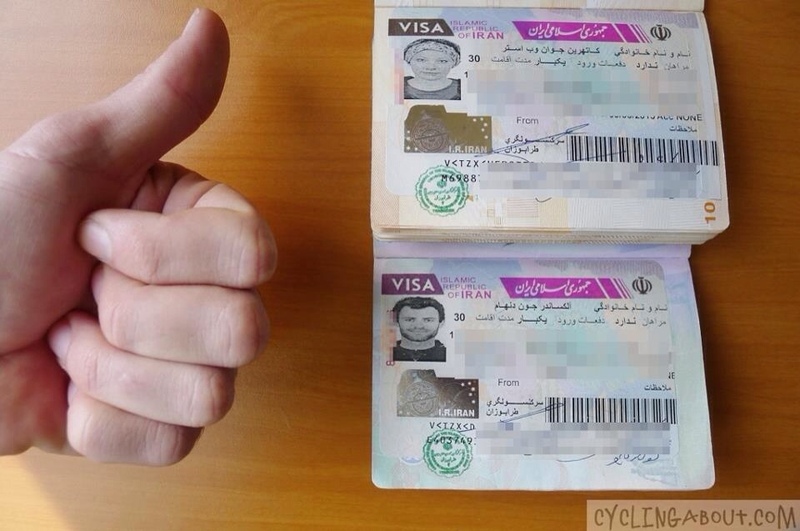 The Iranian visa took us the longest to organise, but it was worth the hassle! Which Countries Are The Easiest To Get A Visa For? Georgia will most likely give you a one year visa on arrival. Kyrgyzstan will give you two months on arrival. Did You Have Problems at Border Crossings? My detailed visa and border crossing information can be read HERE. Most border crossings were over in one hour or less with no trouble at all. The longest border crossings were entering Iran and Turkmenistan. Turkmenistan took us over six hours of waiting to get processed – not ideal on a five day transit visa. What Is This ‘Registration’ in Uzbekistan? Registration is a paper slip which hotels provide to verify that you stayed with them. – You need registration once every three days you are in Uzbekistan (most common information floating around). – You need registration if you stay somewhere MORE than three days (the German embassy told this to a friend while I was in Tashkent). I was given a tough time once at a police checkpoint regarding registration, but I think the officers were just after a bribe, which never came to fruition. Remember to play dumb! My best advice is to get a number of registrations – it’s better to have something rather than nothing. 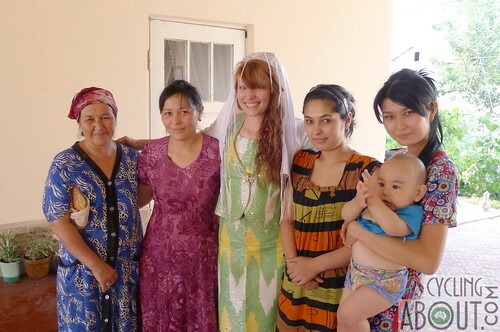 Kat dressed up by a beautiful family in Uzbekistan. How Do You Pronounce Kyrgyzstan?! I Love History, Where Should I Visit? Iran and Uzbekistan are the historical highlights for Central Asia. Especially Esfahan, Yazd and Shiraz in Iran, and Bukhara and Samarkand in Uzbekistan. 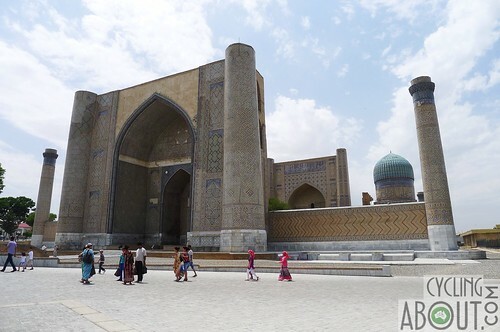 Bibi-Khanym Mosque in Samarkand, Uzbekistan. The incredible Khaju Bridge in Esfahan, Iran. What Language Should I Learn for Central Asia? Russian is handy in every Central Asian country except Iran, where Farsi is spoken. A solid suite of Russian sentences will have you travelling smoothly! How Should I Greet People? A handshake is often all that is required to start a good relationship with a local. “Hello” and “how are you?” in the local language are very much appreciated too. Should I Pay A Tip at Restaurants? Most restaurants will add 10-15% to the bill at the end for a tip, so it is not necessary. Run an eye down the bill to feel secure, but you’ll usually be happy! Do You Have Any Videos on Central Asia? I have a whole series of them! Don’t Forget To Read My Stories From The Road! If You Have More Questions About Central Asia, Leave A Comment Below and I’ll Answer Them The Best I Can. FAQs: What's Next for Alleykat?